The purist in us says no, but the player says yes! This is a great, affordable example of the modern steel/nylon hybrid. Very clean build. Modern steel/nylon design and playability. Plugged-in performance. Higher tension strings might liven up its acoustic performance. No notch filter. The original gut, now nylon-string, 'classical' guitar has been used by countless highly influential non-classical players, yet is still seen by many as a secondary choice. However, today, its cache has arguably never been higher on numerous pop, rock and world music recordings and stages. "With a clean build and a satin finish, the solid spruce-topped Coral-NY is typical of the modern hybrid steel/nylon"
In its cutaway electro guise it's a rarer bird and what has gradually emerged is a new hybrid instrument, a crossover between the steel-string flat-top and the concert or flamenco-style classical guitar. With a clean build and a satin finish, the solid spruce-topped Coral-NY is typical of the modern hybrid steel/nylon. It's certainly unrestrained by tradition, with its inverted headstock tip, steel roller individual tuners, small neck block, 14-fret neck join, truss rod and oversized tie-block bridge. 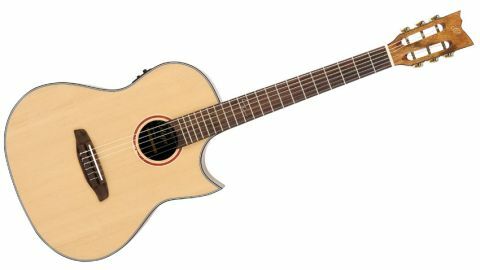 A pointed Florentine cutaway adds to the modernist air, likewise the subtle non- Spanish soundhole decoration and 12th fret 'squiggle' inlay. Its body is a bit thinner-depthed than the Rodriguez (90 to 84mm, or 3.54 to 3.31 inches). Although the nut width is the narrowest on review and its deep C-section neck is very steel-like, it plays very well. Reflecting the guitar's style, the Coral-NY's unplugged tonality is light, as is its projection. It's certainly not a Spanish sound but, like other modern hybrids, it's a very usable sound for jazz and more modern Latin styles. "Plugged in, we heard a nicely balanced output, and that brings the guitar alive"
Plugged in, we heard a nicely balanced output, and that brings the guitar alive. It's actually quite Taylor-like in its modern, brighter tonality. And although the preamp only features treble and bass EQ, it's neat and very usable, and overall, the Coral-NY provides the best amplified sound of our electro-acoustic trio.